"Higher Vibrations!" - the walk in choir that supercharges your week! MEMBERSHIP: Our choir is open to anyone who loves to sing, and already has a working relationship with their singing voice. We welcome people from different singing styles, degrees of experience and training. Whether you are a professional vocalist, shower singer or freeway diva, we have a place for you! Our choir members have a sincere desire to cultivate their singing voice, improve their musical skills through singing in harmony and develop greater powers of self expression in a network of spiritually active people. PHILOSOPHY: Our events are non-sectarian, and non-denominational - though our music has a decidedly spiritual focus. The music features lyrics which speak of the beauty and wonder of Cosmos, humanity’s divine Destiny, personal empowerment, the importance of community, and our call to be in service to humanity. Adult students of all faith traditions are welcome. 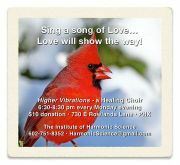 HISTORY: The Institute of Harmonic Science ( 501c.3 non-profit educational organization) has taught individuals and groups of people to utilize singing as a vehicle for personal/community growth and transformation since 2000 in Phoenix. AUDITIONS: As always there are no auditions. KNOWN SIDE EFFECTS: Our participants consistently report increased states of inner peace, joy and spiritual awareness. Many participants routinely enter into a highly meditative "out-of-body" state while singing in our group. It is quite common for the group to sit in silence after a song is complete 'basking in the glow" of the energy field into which we have traveled. TUITION:Our courses throughout the year are priced according to the number of sessions in the unit. 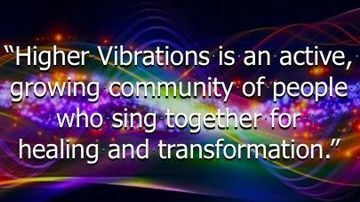 The suggested donation for Higher Vibrations! events is $10. Some events and performances are free. SCHOLARSHIPS:We have limited partial work scholarships, available by need. NOTE:This is not a traditional choir. 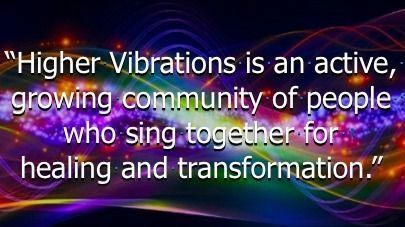 The teaching methods have been developed to move people quickly from reading music and learning parts to creating improvisational performances which are highly inspirational and transformative.Higher Vibrations is a spiritual journey disguised as a choir. INSTRUCTOR: Harold Grandstaff Moses, PhDE is a composer, improvisation pianist & violist, educator and director of the Institute of Harmonic Science. In addition to operating a recording and music scoring studio, he works with the Mind-Body Department of Cancer Treatment Centers of America in Goodyear, AZ.